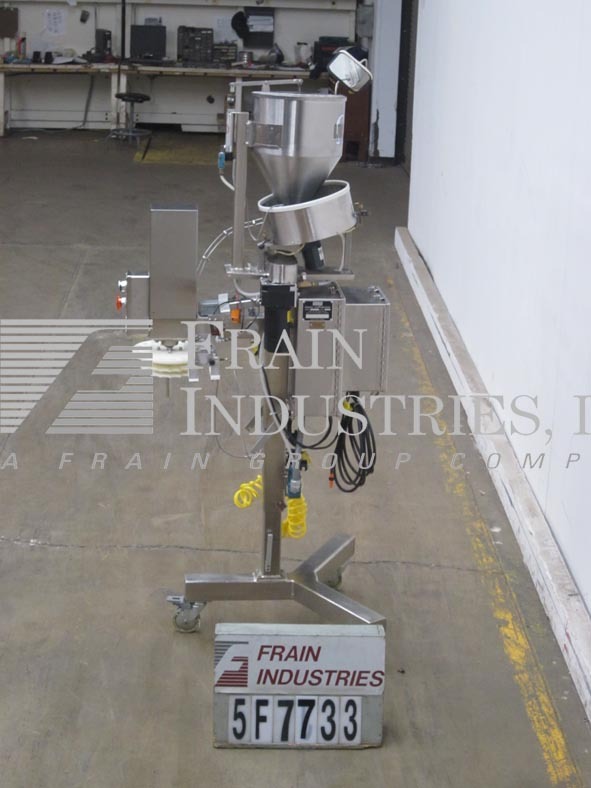 Frain Industries can help you with your desiccant feeder project no matter how big or small your feeder needs. Feeder Desiccant are machines that feeds desiccant pouches into a container. Desiccant draws moisture from the air to prevent moisture inside the bottle from affecting the product. 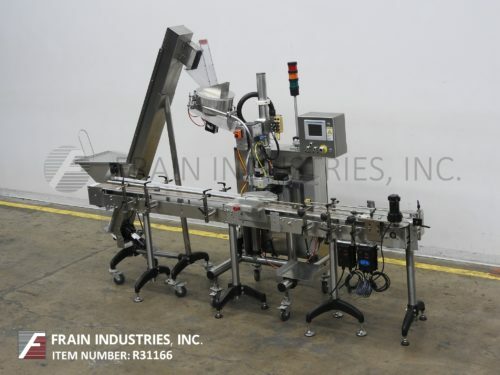 ABOX Automation, Model PD2, Stepper driven, automatic, pre-made horizontal desiccant or pouch feeder. Rated from 50 to 200 pouches per minute – depending on materials application, length of pouch and machine configuration. Designed to deliver small to medium size pouches wound on a reel. Equipped with a 24" long timing screw, 12" OD product reel with 1½" ID core, registration, no container / no pouch and scissor cut off. Control panel with on / off controls, variable speed and mounted on H-base style frame with locking casters and designed to mount over existing conveyor. Omega Design, Model CDFR-1.5D1, "canister style" desiccant feeder. Rated from 50 to 300 bottles per minute – depending on materials, application and drops per bottle. Feeds 1 – 3 gram desiccants into containers with proper change parts. All stainless steel construction. Equipped with a 23" long x 16" wide x 20" deep feeder hopper, 70" long inclined belt with 2" high cleats on 4¼" centers and a 74" discharge height. 18" OD product sorting disc, 12" long x ½" wide container spacing belts and pocket style canister dispenser. AB PanelView Plus 600 controls and control dials for spacing belt, elevator drive, preorienter drive and spacing drive. Mounted on stainless steel base frame with casters. Change parts required for different size canisters. Omega Design, Model CDFR-1.5D1, "canister style" desiccant feeder. Rated from 50 to 300 bottles per minute – depending on materials, application and drops per bottle. Feeds 1- 3 gram desiccants into containers with proper change parts. All stainless steel construction. Equipped with a 23" long x 16" wide x 20" deep feeder hopper, 70" long inclined belt with 2" high cleats on 4¼" centers and a 74" discharge height. 18" OD product sorting disc, 12" long x ½" wide container spacing belts and rotary pocket style canister dispenser. AB PanelView Plus 600 controls and control dials for spacing belt, elevator drive, preorienter drive and spacing drive. Mounted on stainless steel base frame with casters. Change parts required for different size canisters. Kalish, Model 920001, barrel style desiccant feeder. Rated from 40 to 120 CPM depending on container size and machine configuration. 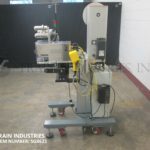 Equipped with a 16" diameter x 15" deep product funnel mounted above a 24" diameter vibratory feeder bowl with variable speed control and 1¾" high rails, 7/8" wide feeder chutes with photo eye sensor and hand crank adjustable discharge height. Insterter controls include on/off switch, speed controller, bottle gating and pusher ram force. Mounted on a stainless steel base frame with casters. Barrel-style desiccant feeder, capable of feeding up to 200cpm (depending on size). Currently set up to insert 1 standard, (1/2" diameter) or 1 gram desiccants at a time. Equipped with 12" x 9" infeed and cleated conveyor. Unit mounted on adjustable legs and lockable casters for mobility. Last running in a pharmaceutical operation. Omega Design Model DF-1D1, free standing portable stainless steel, desiccant feeder capable of single, double, or triple drop feeding of a 1gram to 3 gram "barrel" style desiccants into containers at speeds from 50 to 300 barrels per minute on 1 drop – depending on materials and application. Equipped with 12" diameter x 15" deep stainless steel product hopper with cover, 10" diameter adjustable feed wheel and container orienter with container and desiccant verification eyes, adjustable drop height currentlt at 38" discharge height. Control panel with PLC controller start, stop and up, down push button controls, mounted on stainless steel base with casters. Change parts required for product changes. Automatic, desiccant or pouch feeder rated at speeds up to 245 ppm depending on size pouch. Designed to dispense pre-made pouches and has a size range of: 3/4" – 3 1/2" L x 3/4" – 3" W x 1/32"- 5/16" Thick, 12" W OD product reel with 1 1/2 " ID core, regiistration, no container / no pouch, scissor cut off, hand crank height adjustable column, on / off controls and is mounted on H-base type frame with locking casters made to roll over existing conveyor. Automatic, desiccant or pouch feeder rated at speeds up to 245 ppm, depending on size of pouch. Designed for pre-made pouches and has a size range of: 3/4" – 3 1/2" L x 3/4" – 3" W x 1/32"- 5/16" Thick, 12" W OD product reel with 1 1/2 " ID core, registration, no container / no pouch, scissor cut off, hand crank height adjustable column, on / off controls and is mounted on H-base type frame with locking casters made to roll over existing conveyor. Automatic, desiccant or pouch feeder rated at speeds up to 245 ppm depending on size pouch. Designed to dispense pre-made pouches and has a size range of: 3/4" – 3 1/2" L x 3/4" – 3" W x 1/32"- 5/16" Thick, 12" W OD product reel with 1 1/2 " ID core, registration, no container / no pouch, scissor cut off, hand crank height adjustable column, on / off controls and is mounted on H-base type frame with locking casters made to roll over existing conveyor. Automatic, desiccant or pouch feeder rated at speeds up to 245 ppm depending on size of pouch. Designed to dispense pre-made pouches and has a size range of: 3/4" – 3 1/2" L x 3/4" – 3" W x 1/32"- 5/16" Thick, 12" W OD product reel with 1 1/2 " ID core, registration, no container / no pouch, scissor cut off, hand crank height adjustable column, on / off controls, and is mounted on H-base type frame with locking casters made to roll over existing conveyor.